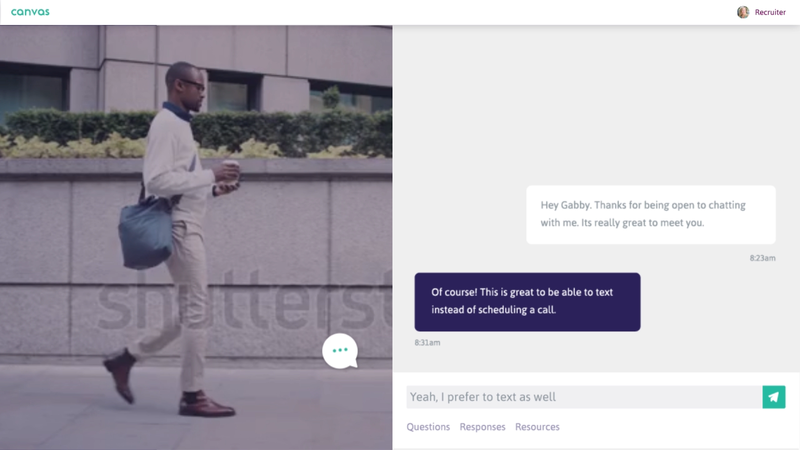 The world’s first text-based interviewing platform has arrived. Recruiters are ready to fly. Canvas gives them superpowers. Super-recruiters can see everything about every candidate at any time, and know just how to reach them. They always know the next best question and ultimately hire the right people in less time. The talent economy called. It said things have changed. You rock. We’ll be in touch soon. Reaching candidates and filling positions takes time. Canvasbot, your AI sidekick with a full suite of automation superpowers, makes it faster. Notes are captured automatically, transcripts are shared easily, and the right candidates move through your process more quickly. Kapow! Canvasbot sources candidate information using natural language processing with no human interaction. Next, Canvasbot automates some (or all) of the screening process. When human recruiters step in, they have what they need to shine. See candidates like never before. With Canvas, see future employees and teammates based on what they bring to the table. Canvasbot screening helps you find the most qualified candidates, de-identification reduces unconscious bias, and recommended questions help standardize recruiter responses. Meanwhile, every interaction is captured in Candidate Portraits with no extra work. Chats are automatically summarized, scoreable and shareable—no note-taking necessary. Delight with a flawless experience. Applying for jobs is exhausting enough. Then comes the interview process. With Canvas, your entire team can shift the conversation to a candidates’ preferred channel – texting – then start talking where and when they want. Provide immediate access to resources, never duplicate questions, and easily stay in touch over time to build relationships. We just posted a new article on leadership, I think you’ll like it. Candidates don’t have to change anything about how they communicate. With Canvas you can reach them through the channels they already use. 50 million millennials will be hired between now and 2025. Your next generation of talent is texting – only 12% prefer phone calls for business communication*, understandably so. They land dates with a casual swipe, but recruiters are still screening over the phone. They tap  to keep tabs, while we tap ② to re-record voicemails. It’s time to join the convo.